Research through Artistic Practices: An Insight! ‘Research through Artistic Practices’ – while working through this course, I was completely unaware of the fact that I was learning to research through certain artistic practices. I only thought of it as a medium of exploring different materials to find the interest of one’s own self. Frankly speaking, when our faculty, Rakhi, used to ask us to go beyond and explore, I hardly understood the exact meaning of what she was trying to tell until our last class, where bingo! I knew exactly what we were doing in this course. Suddenly each and every word that Rakhi spoke throughout the course, rang like a bell in my head, made absolute sense to me and I now know, what we had been doing could reach to a greater level but I then only felt, ‘I wish I could discover this earlier’. Quite a few things happened in the last class and the week before, that suddenly triggered in me the idea behind Research through Artistic Practices. First of all, I realized the importance of concept in any work. This was partly because of Rakhi’s teachings and partly because of a friend’s words that I came across while in a serious conversation with her. The line that I remember is, “Without a concept, your work would just add on to the heap of products in the market. A strong concept leads to form the identity of the product and the individual”. Now, after serious conflict between my listening and thinking muscles, I could not resist but asked this question to Rakhi – after all, why is it necessary at all to trace back history. What Rakhi told me imbibed in me the importance of the artistic history in terms of tracing back its cultural importance and having an identity of the work itself. A couple of Rakhi’s words galvanized me, “If I look at any piece of art and could link it to something that brings out the identity of it or shows something about its cultural background, only then I can term it as ‘work’ otherwise it just a hobby inspired activity“. The last class of Research through Artistic Practices inspired me to work in a particular direction by giving in 100 per cent importance to it and by researching through the artworks and works that have been done until now. 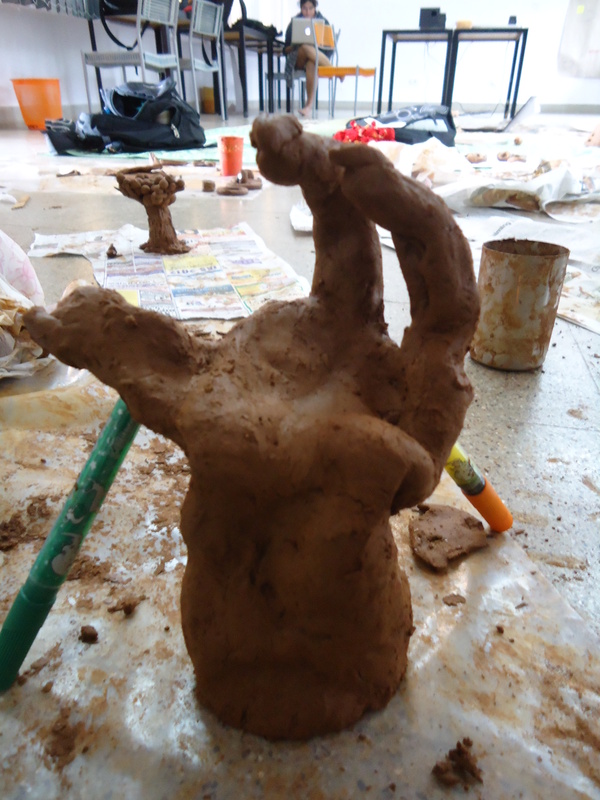 Well, after this class, whatever I was developing in clay felt so dis-satisfactory. I had started working on a model of a chair that was designed by me in under graduation. I remember, when I told Rakhi what I was doing, she had asked me about the details of its history of research. That time, I couldn’t understand what exactly she was asking for. But now as I have understood it well, I have started researching on the extent of work done in clay in furniture and architecture architecture. Although it feels pointless at the moment for developing that chair, but I have decide that I will complete it and after my research, go on developing a different work with an all new insight. This would instill in me the sense of self-satisfaction and I will be able to spot the difference in the quality of work and the impression of it on my audience. As I have worked in clay before elementarily, it was not very difficult for me to handle the material but what I came across now and found interesting was the freedom of expression through form with this material. 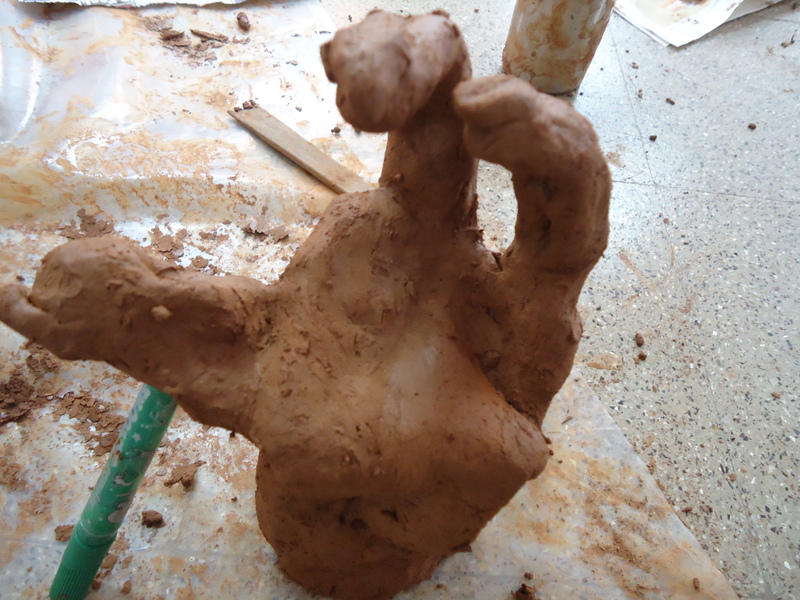 Clay is the best material to express through form. The stop motion animation film, ‘Food’ by Jan Svanmajer, shown to us during a class, redefined for me one, the extent of using clay as a form and two, conceptualization. I feel that I have learned a big lesson towards the end of this course which is actually beneficial. ← Student Self Evaluation Report! Very interesting post. It is great that you have had these revelations, even if this has brought about some personal dissatisfaction in your work with clay. Where will you go from here? As I have mentioned in this post, while working with clay I found a link towards researching on the material to the extent of its use in furniture and architecture. While researching, if at all something clicks me or interests me to an extent that I can work with it, I am sure it would be of some great deal of advantage.